​Would you consider cheap business cards to be good for your business? That feeling of Regret, you know what it's like to buy a set of business cards and then regret that you went with the cheap ones instead of paying a little bit more for some higher quality business cards. I don't like to feel regret. Nobody likes to feel regret. I want to feel great about myself and my business. Do you want to feel great about yourself and your business? Handing out those cheap, rough feeling, flimsy business cards really makes you feel like you're dishonoring your business. Let's face it, it's embarrassing. In fact, you're bringing shame to your business image when you settle for cheap business cards that don't reflect your high class standards when it comes to what you offer your clients. Your business cards should reflect the quality of your business. Do you need business cards that reflect the high quality of your business? I painfully discovered through trial and error that the best business cards are those that when you hand them to a potential customer, their eyes light up. And they are struck by the silky smooth feel and the glow of gold and silver foil. Finally, a business card that won't get tossed into a trash can! People started holding on to my cards because they're awesome business cards. And best of all, they keep on coming back for more business because the quality of the business card is synonymous with the quality of my business. That's the way it should always be! Making the absolute best business cards for successful entrepreneurs has been the aim for ShaynaMade. And we are happy to say, that is exactly what we deliver. The very best business cards and customer service in the industry. ShaynaMade business cards help you connect with customers, revolutionize your marketing and grow your company. If you need business cards that actually convert customers, then look no further. 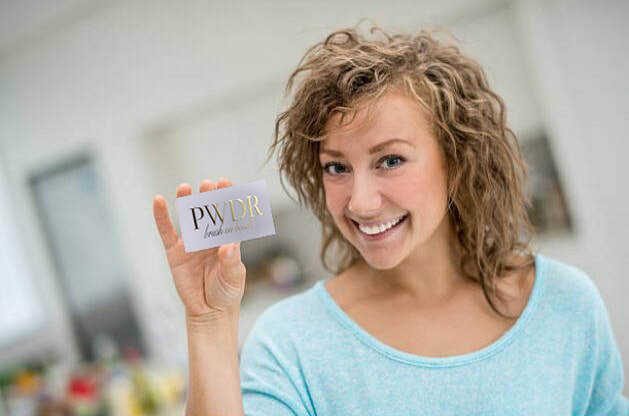 We've helped thousands of entrepreneurs just like you get the business cards that you really want and deserve. At ShaynaMade, we create both RAISED foil and FLAT foil business cards in a variety of foil colors. You can view the foil colors further down on this page. There are sooooo many pretty colors to choose from.